This classic dessert is in fact a cake layered with custard and topped with chocolate glaze, so don’t let the name fool you! 115g cooled unsalted butter, cut into cubes. Sift the sugar, cake flour, baking powder and salt into the bowl of your mixer. Add the butter cubes and using the paddle attachment, cut the butter into the flour until it resembles a crumb texture. In a separate bowl, whisk the eggs, milk and vanilla essence. Pour the egg mixture into the flour mixture and beat on a low speed till everything comes together, then beat on a high speed until the batter is pale and thick roughly 10 – 15 minutes. Pour the batter into a greased 20cm cake pan and pop into a pre-heated oven. Bake at 180 degrees for 20 – 25 minutes, or until the cake tester comes out clean. Allow to cake to cool in the pan for 30 minutes, before turning out onto a cooling rack and allowing to cool completely. To make the cream filling, heat the cream and the milk in a sauce pan over a medium heat. Add the vanilla essence and mix, until the mixture to just start to simmer. In another bowl, whisk the eggs yolk, sugar and corn starch. While whisking, slowly pour over the hot milk mixture and whisk till well combined. Pour the entire mixture back into the sauce pan and return to the stove. Whisk constantly until the mixture becomes thick and glossy. Place the butter in a dish with a sieve balanced over it. Immediately pour the cream mixture through a sieve and using the back of a spoon, push the mixture through the sieve. Allow to mixture to cool slightly, then place a piece of cling wrap on the surface of the mixture, this prevents a skin from forming. Heat the cream, till it just starts to simmer. Pour it over your milk chocolate disks and stir until well combined. Add the corn syrup and oil and mix well. Cut the cake into two layers, place one layer down on your cake stand. Add the cream filling and evenly spread over the center. Place the second layer on the top of the cream mixture. Pour the ganache over the top of the cake and using an offset spatula spread the ganache over the top. Pop into the fridge to chill till the ganache has set. Delicious, Esme, and this cake looks so nice too. I will convey your note to Bobby, she will be delighted to hear from you. 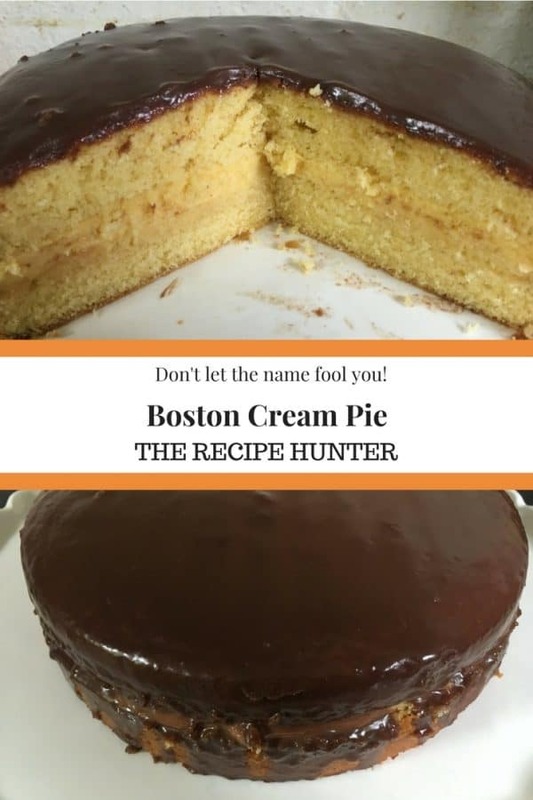 I love Boston Cream Pie. Yum. This looks like a good one. Thank you John. Bobby will be so happy when I pass your note over to her.